Posted on 01/14/2019Is it safe to go barefoot in my house? Posted on 01/03/2019Why are my feet numb and what can I do about it? ?Can You Use Biofreeze For Neuropathy? ?My feet feel numb...Am I diabetic? ?Is it true that there is nothing that can be done for peripheral neuropathy? Posted on 12/26/2018 What to Eat Wednesday: Can Horseradish Help My Numb Feet? Posted on 11/09/2017 How Can You Alleviate the Pain of Neuropathy? Can You Use Biofreeze For Neuropathy? People who are suffering from peripheral neuropathy in Houston are on a constant lookout to help to moderate their symptoms. There is an overwhelming amount of remedies, however, some of which work better than others. Biofreeze, a topical analgesic, is one such remedy that helps to provide temporary relief from the pain from peripheral neuropathy. Biofreeze is a topical analgesic which comes in gell, roll-on, and spray form. It started as a commonly used sports' pain relief gel but has since become much more widely used. Biofreeze contains Ilex which is an herbal extract that aids in producing its therapeutic effect. Unlike other sports gels, Biofreeze only has a cold therapy, which helps to reduce inflammation. Biofreeze is effective for many people in helping the burning pain often associated with peripheral neuropathy. I typically recommend the spray form, likening it to a fire extinguisher to spray away the burning. Biofreeze can be used throughout the day and offers no adverse effects. We always carry Biofreeze in our Houston podiatry offices. If you would like to pick some up to try, give us a call and come on in. No appointment is necessary! Many people who read this wonder My Feet Feel Numb...Am I Diabetic? My feet feel numb...Am I diabetic? 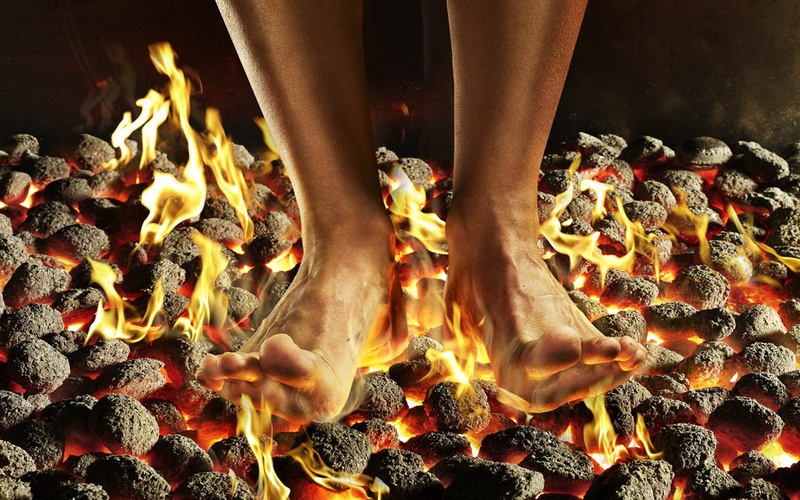 Peripheral neuropathy often causes a burning and stinging pain in the feet. Not every case of peripheral neuropathy is due to diabetes. Also, not every person with diabetes develops peripheral neuropathy. I find some of my Houston patients are told by physicians that their numbness caused by peripheral neuropathy is a precursor to diabetes. This is not true. Peripheral neuropathy can, and often does, stand alone from diabetes. When diabetics do develop peripheral neuropathy, it is a result of diabetes and not vice versa. In fact, there are even people who are diabetic, but the cause of their peripheral neuropathy is from something other than diabetes! Now that I've provided you more confusion, the bottom line is to not make assumptions. Visit your Houston podiatrist to determine the cause of your peripheral neuropathy. Those who found this helpful also wondered Is it true that there is nothing that can be done for peripheral neuropathy? Is it true that there is nothing that can be done for peripheral neuropathy? It is the perception by some, including many physicians, that there is nothing you can do for peripheral neuropathy. That is just not true! That's not to say that everyone will benefit from every treatment. In fact, there are those who suffer from peripheral neuropathy who do not respond to ANY therapy. It is important to keep a positive outlook and try what is available and see how you respond. There are some medications that effectively treat peripheral neuropathy. These can include medication such as Lyrica, Cymbalta, and Neurontin which treat nerve pain. Additionally some use narcotic pain relievers, particularly at night, to alleviate pain. Nutritional supplements, such as Neuremedy, NeuRx-TF, and Metanx treat vitamin deficiencies that contribute to peripheral neuropathy. There are also therapies that restore blood flow to the nerves, such as MicroVas therapy, are often effective in diabetic peripheral neuropathy which has a strong circulatory component to it's cause. Some also perform nerve decompression surgery which can also provide relief. If you are suffering pain or numbness from peripheral neuropathy, contact Houston podiatrist Dr. Andrew Schneider to see which therapy can offer you relief. Most who found this helpful also wondered Is peripheral neuropathy caused by bad circulation? Is peripheral neuropathy caused by bad circulation? Some doctors seem to be blaming everything on peripheral neuropathy these days. The problem is that in their next breath, they tell their patients that there is nothing that can be done for it. Poor circulation certainly is one cause of peripheral neuropathy. This is particularly true with diabetic neuropathy. It should be noted, however, that not every case of poor circulation will lead to poor neuropathy and, certainly, not every case of peripheral neuropathy is due to poor circulation. Circulation problems is a common cause of diabetic peripheral neuropathy. The small vessels that deliver blood to the nerves are damaged by the high sugar levels. This reduces the amount of oxygen and blood to the nerves. This causes the nerves to react by becoming numb or painful. The combination of peripheral neuropathy and peripheral arterial disease can be deadly, causing foot ulcers to form, gangrene, and foot amputation. At Tanglewood Foot Specialists, we use PADnet to assess for reduced circulation. This simple, painless, 30 minute in-office test wil compare pressure readings to determine if there is blockage in the arteries in your legs. Contact Dr. Schneider for an immediate appointment, often same day! Most people interested in this also wondered Does true peripheral neuropathy cause numbness or pain? Does true peripheral neuropathy cause numbness or pain? Peripheral neuropathy can cause either pain or numbness. Whichever one is the main symptom, neither are pleasant. The numb feeling can start with the feeling that the socks are bunched up, although they are not. This can progress to a full and profound numb sensation in the feet and can progress up the leg. Often, the protective sensation that one feels is gone and puts the foot at risk for infection, caused by a simple splinter, or a foot ulcer. Numb feet such as these also causes significant balance issues putting these patients at risk for falls. Pain caused by peripheral neuropathy is often quite severe. It can range from being reactive to hot and cold extremes, to constant sharp pains, to burning, to hot pokers, to any type of pain that you can imagine. Sounds horrible...it is! The constant pain often keeps people from sleeping too, which further impacts their life. Whether painful or numb, both are presentations of peripheral neuropathy that must be addressed. What is causing my peripheral neuropathy? Peripheral neuropathy, which is pain or numbness in the feet, can be caused by a number of factors. The most common cause of peripheral neuropathy is diabetes. Diabetic peripheral neuropathy occurs when the blood sugar level stays high and causes damage to the nerves and small blood vessels. This reduces the amount of blood, which carries oxygen and nutrients, that reaches the nerves. Other common causes of peripheral neuropathy include chemotherapy, alcoholism, different autoimmune diseases, and many other conditions. Unfortunately, there are many times where a patient will have symptoms consistent with peripheral neuropathy but a true cause cannot be determined. While frustrating, there are constantly new studies, advancements, and treatments that improve the outcomes allowing these patients to find some relief.